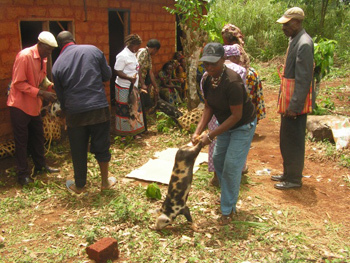 Theme for 2015 ;- "Sharing opportunities and Praising God"
As a way of alleviating poverty in Cameroon, Djouke chooses the promotion of pig production as the best method. 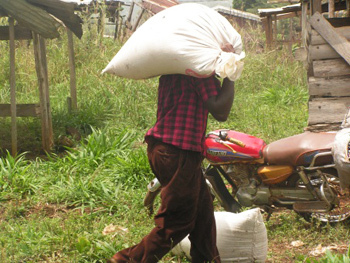 By donating pig feed and female piglets to new set of farmers each year to breed and then pass over the gift to another poor deserving farmer(Passing on the Gift:POG), Djouke has been able to assist over 100 farmers. She has been working with Atomba Titus Tegwi as her Cameroonian based local representative or project coordinator since 2007 working with village communities of the North West Region of Cameroon while aspiring to move further into other communities if her means can permit. This narrative report will render account of how 600 Euros sent by Djouke in November 20014 has been effectively used in Cameroon to realize her dream in 2015. STEP ONE - Project Evaluation meeting. 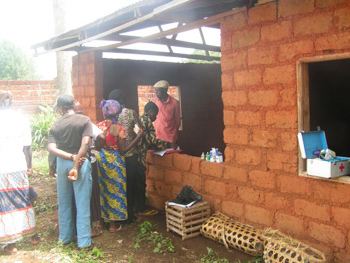 On Tuesday 3rd February was Bawock community village Market day, the day scheduled for a meeting of the 2014 beneficiaries of the Pig Van Djouke POG program. The meeting was aimed at evaluating the level of success attained by the beneficiaries and the number of piglets ready for the POG and the benefits they have had so far from the project. 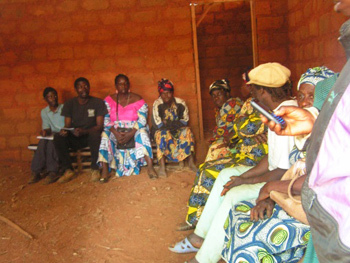 Prior to this meeting, a general assembly meeting took place in Bamenda on the 22nd of December during which their mind set were prepared for the February 3rd meeting. During the meeting that lasted for about one hour, beneficiary farmers shared their experiences. 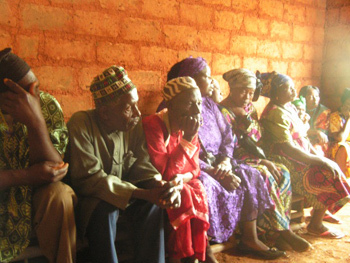 Questions came up after we reviewed the last year report submitted to Djouke which indicated the latest date for beneficiaries to POG to new set of beneficiaries. Some people protested that their own piglets that were given were not god breeds so their growth was retarded and up till now the pigs were not yet crossed. Others said that theirs were still pregnant, and other said weaning will be by the end of February. The bottom line is that the was no pig yet to hand over. Those who wished to be new beneficiaries wanted that the POG should be given immediately but the last year beneficiaries wanted a bit of delay to enable them purchase from other farms and Pass over or wean the piglet for those whose pig delivered (farrowed). Close observation during field visits proved that some of the pigs were actually starving, with little or no food or water was in their water trough After a prolong debate with threats of moving to a new community with Djouke's project fund for 2015 if urgent action is not taken, it was then agreed that latest date to receive POG piglets from those owing will be first week of March. - Saturday - 7th March 2015, as agreed, we had a meeting in Bawock in the incomplete cooperative hall as usual. We told 2014 beneficiaries that we were not happy with the delay because it will just help to retard other actions from the Netherlands. We also resolved that female piglets for the POG must not just be any type but best selection with high potentials of rapid growth so that they can meet up with the anticipated time of POG. 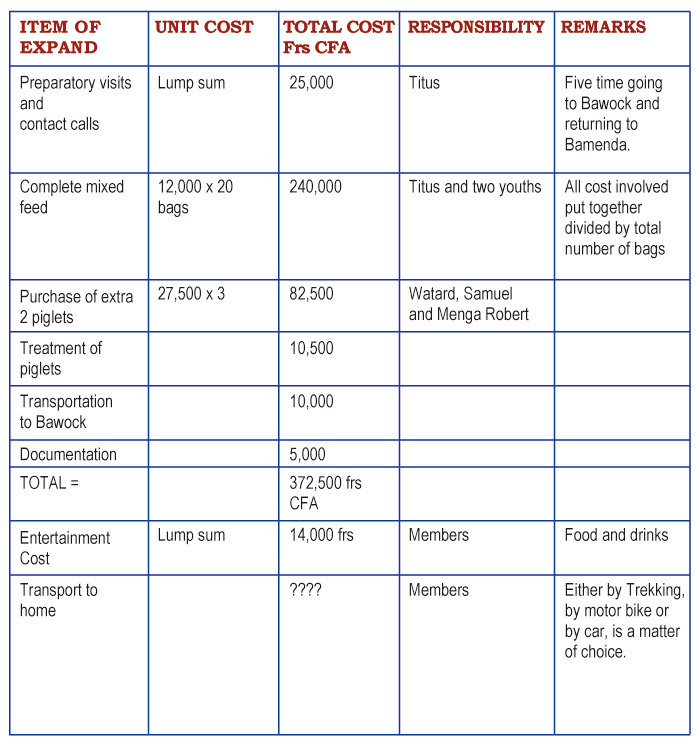 Two piglets were given by Justine Mbianda and Beatrice, while other did not give theirs yet, promising to do that only when their pigs have farrowed or when they will be able to buy and give for those whose pig did not perform well. 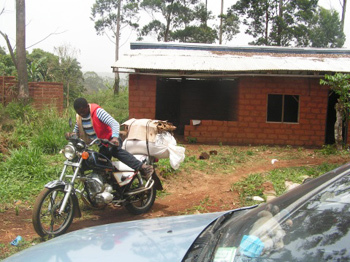 The pigs were kept and fed at the cooperative head office in Bamenda waiting for the rest of pigs from others who have promised to provide within the shortest time possible. In all only 7 people will benefit in 2015 considering the number of pigs available and the fact that 3 extra piglets will be bought to make up for the stolen two and that of Limen Elisabeth which is hopeless and we advise her to slaughter. 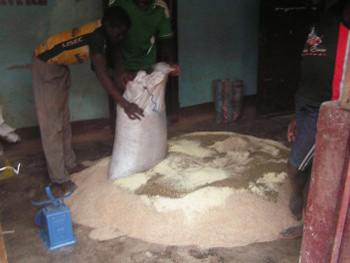 Feed ingredients were purchased in bulk from the Bamenda main market, transported from point of purchase to point of collection to the cooperative by a manual truck and then by car to the cooperative. 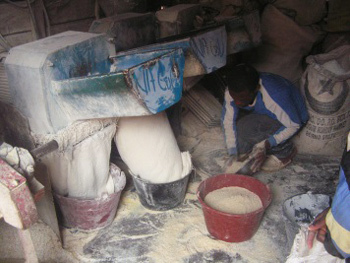 Corn (Maize), soya bean and fish meal were processed at a grinding mill first ready for use before taking to the cooperative hall for manual mixing. 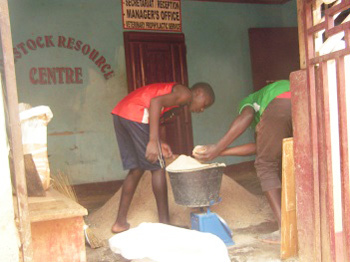 At the cooperative building the various feed components were weighed proportionately and put together to have a complete balanced grower mash ready for the piglets to be handed over. 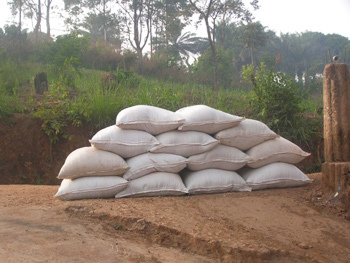 A bag of 50kg each was composed of Wheat bran, Palm Kernel cake, Corn(maize), Fish meal, soya bean, Bone meal and salt. In all we composed 20 bags to be given to both the new beneficiaries and those to POG who successfully gave their piglets in time as a reward for excellence. 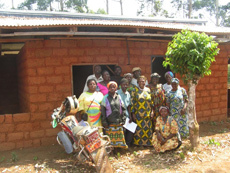 On the 15th March - a meeting for the selection of Beneficiaries was held in Bawock. It was a long debate as to who has to benefit and who will not. Previous meeting attendance list and records of group work participation especially meetings that took place in Bamenda while I was in Japan was one of the major criteria for selection. Moments of tension came when some people claim to have attended those meetings but their names did not feature on the record list. Another point came up that group leaders propose beneficiaries for their groups but when it comes to recovery they step back and stay silent and moreover they make no effort to see that the pigs are properly fed to ensure the respect of POG timing. Others argued that beneficiaries should have a good fence and be able to feed the pig sustainably after the project feed stuff gets finished and not to continue with poor feeding. Another puzzle was that if we have to give to those who are financially viable then how do we intend to alleviate poverty if only those who have the means and fences will benefit first? Then came the role of the engine saw in helping people construct new pi g pens or the repairs of old ones. Members were recalled to benefit from that service which is controlled by Njeji Peter, engine saw operator on request. 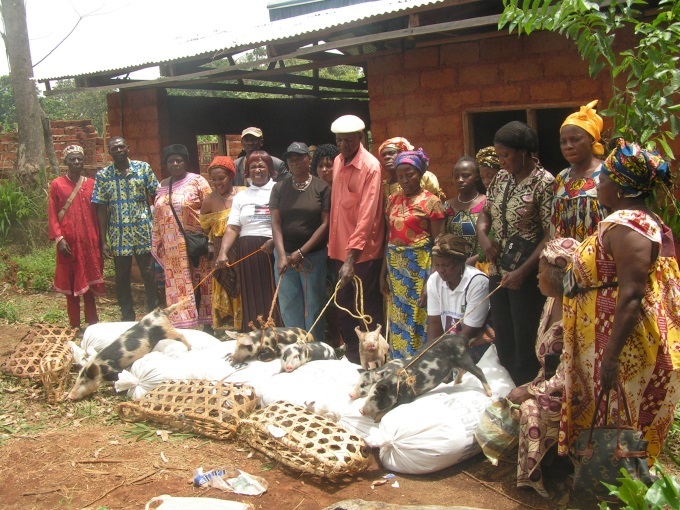 - 18th March - Handing over of POG piglets and feed to deserving beneficiaries. Pigs and feed were transported to Bawock by public transport means and at the cooperative building discussions continued. The list of Beneficiaries was validated a word of caution was given to the new beneficiaries by some of the previous beneficiaries based on their experiences. In a participatory way members shared some health and feeding tips that will ensure success, guided by the project coordinator. The Beneficiary form was filled by the seven beneficiaries. The pigs were all treated for worms, administered some iron dextran injection and vitamins. Because the piglets were not all the same in quality and age, ballot papers were prepared as usual, numbering them from 1 to 7 and numbering the piglets from 1 to 7 also. The numbers were twisted and thrown on the spread sheet and the seven people picked their numbers and go for the Corresponding piglet. The 7th piglets were to be collected at home at weaning in two weeks' time. A closing prayer asking for success in the project from God was offered by Mde Elisabeth Limen. 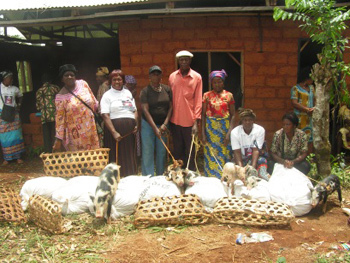 After having a group picture, beneficiaries took their pigs and feed home using different means at their disposal. - Some members of the newly elected project committee of NOWEPIFAC will have to visit the 2015 beneficiaries to see how they have installed their piglets and how these piglets are being fed. In Bawock 28th March and 4th April 2015 are the dates set aside for this special assignment. Other on-going projects have their evaluation visit schedule in April 2015. 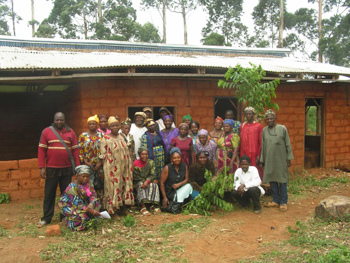 Close observation have shown that this project has spurred NOWEPIFAC members to become more committed to the cooperative to the extent that for the first time since its creation members have made up their minds to put in their annual contributions which to them will enable boost the financial power of the cooperative and render its management more effective. Members have also promised to participate in the monitoring process of this project since they have been able to pay their children school fees from income from the sales of pigs/piglets from the project. Because of poverty and difficulties in feeding statistics dwindling around the same figures because farmers sell to raise income for household needs but on the whole, "A Pig Van Djouke Project" is quite interesting and animating. 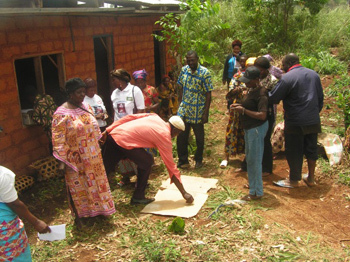 If the target population of this project have to be the poor or under privileged then the project needs to pay more attention to feeding (balanced rations)to enable poor farmers attain their goal of POG because most of the time these farmers switch to poor feeding when the project balanced feed ration is finished so the piglet growth automatically starts retarding.